Makes me ponder on what if there really was a Vatican or other Catholic theme park? Holy Roller Coasters? Now I know marianland bills itself as a Catholic Theme Park. But really a replica of Medjugorje? I really want to see an animatronic Hall of Popes. I believe DanteLand or Dante World would be rather awesome. Dante’s nine circles of Hell would put those Protestant “Hell Houses” to shame. Tour guides would act and dress like the Roman poet Virgil. Purgatory could be just like the “It’s a small world” ride. 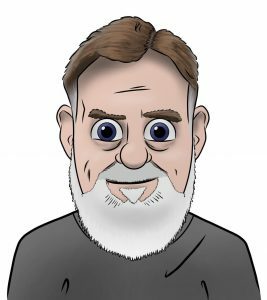 You are forced to listen to that song and go round and round the ride until you have been expiated of all your attachment to sin. Perhaps nothing quite so cruel. I do like the idea of a “It’s a small world” ride where you see examples of Catholics around the world practicing their faith. The universality of the Church does make for something pretty cool. 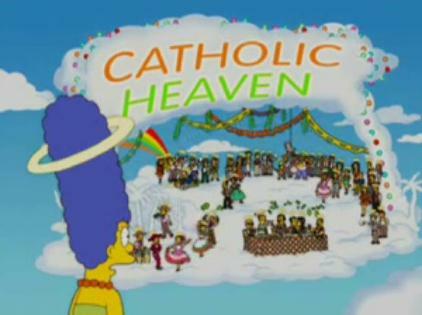 Plus I think the version of Catholic Heaven envisioned in The Simpsons would be really fun as an attraction. Now what attractions could the Vatican build for progressives? Oh I know – labyrinths since they so love them. Really really complicated labyrinths that take years for them to find their way out. Kind of like the Hotel California “You can check-out any time you like, But you can never leave!” Or maybe fun house mirrors. Well maybe not since they so distort Catholic teaching everything might look normal to them. Perhaps you can think up an even better ride/theme? Can I see your music collection? Catacomb Coaster Ride – relive the excitement of living in the catacombs in the early years of the Church! Be chased by legions of Roman troops, and survive the climactic Coliseum of Carnage!! Storms Of Galilee – a water ride, in a wave pool that simulates the sort of storms the apostles experienced when on the Sea of Galilee. Though not technically Catholic, but a 3-D simulator of Old Testament events, like the Great Flood, the destruction of Sodom & Gomorrah, the 10 Plagues of Egypt, the Flight thru the Red Sea, and the Tumbling Walls of Jericho. Just like being there, without the fire & brimstone! Joking aside, I have actually thought it would be cool to a Catholic version of the Epcot World Showcase. It would show the iconic saints, traditions, architecture and history of the Church across the world. Too bad it would never work. STOP “IT” JEFF CAUSE YOU’RE STARTING TO SOUND LIKE SOME OF THOSE SO CALLED 7% Jesus cells of Victor! There’s no need to yell at Jeff and his readers cause we can all hear ya so whats seems to be the problem sinner vic? FIRST OF ALL, WE WANT YA TO STOP CALLING U>S SINNERS CAUSE WE ARE YOUR gods! OK sinner vic, for arguement sake you gods own 92% of my flesh so what did these Jesus cells tell ya? If you’re serious Victor, we want ya to talk to that “ONE” per sense, I mean (1%) little retardo who keeps saying that he’s the real GOD and going around promising some of our 92% godly cell that if we listen to him, His Jesus will give them each their own Galaxies and you know that’s just crazy and as a matter of fact all of “Reality” is asking him stuff like “What are you saying?!?! and let “IT” leed ya where “IT” may NOW! Like the husband and wife from Bethlehem told me last week: In Palestine we are either Jews, Muslims for Christians, and we are treated the same in each class. The altar rail that brings you around the perimeter of the park stopping at 14 stations along the way. The catholic religion was the first Christianity in the world, others will always be Protestant, therefore…. the Catholic religion is the best !!! !